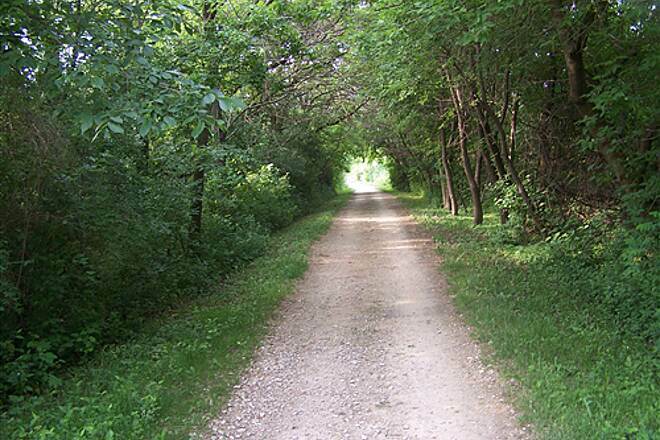 The Illinois Prairie Path (IPP) was one of the nation’s first rail-trail conversions. It consists of five connected trail segments with three main branches that converge at Volunteer Park (West Liberty Drive at South Carlton Avenue) in Wheaton. 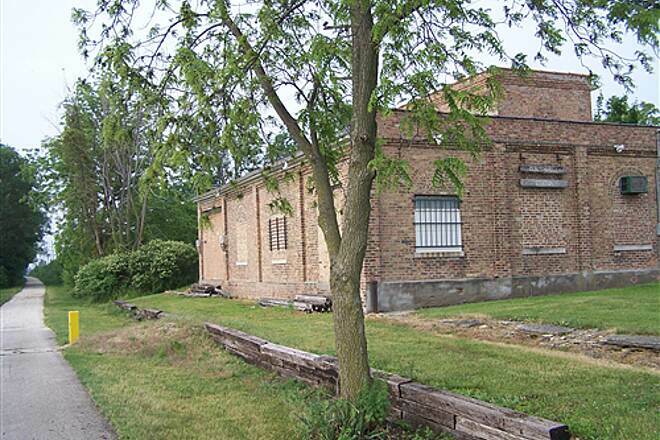 The 58-mile trail follows the historical path of the Chicago Aurora and Elgin Railroad. Beginning in 1902, the electric railroad provided passenger service from the western suburbs into downtown Chicago. With the railroad in decline, some routes were transferred to bus service. The partial completion of the Eisenhower Expressway (I-290) in 1955 spelled the end for this once mighty railroad: by 1959 passenger and freight service on the line were finished. A letter to the editor by noted naturalist May Theilgaard Watts in the Chicago Tribune in September 1963 argued for the novel idea of converting the former corridor into a footpath. 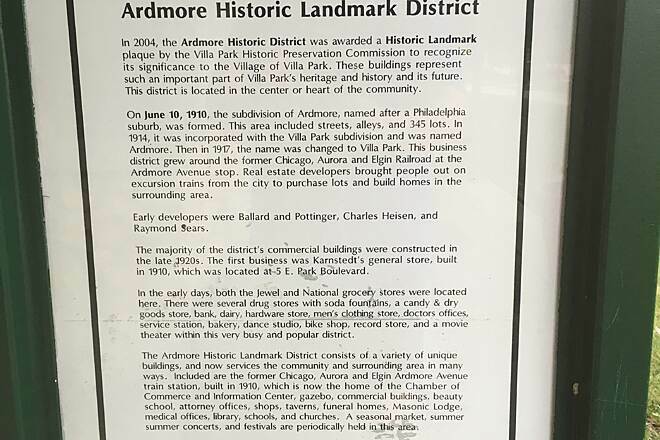 That letter sparked the efforts of a determined group of Chicagoans and ultimately gave rise to the unprecedented conversion of railroad to public trail. 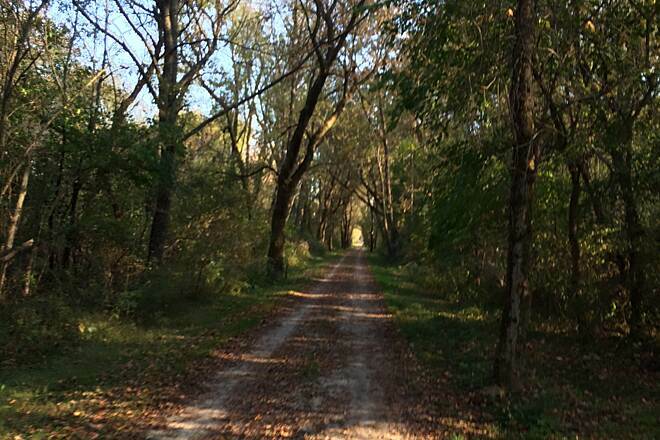 The Illinois Prairie Path’s 16-mile Main Branch is the most urban of its corridors. Beginning in Wheaton, the IPP’s Main Branch follows city streets on extrawide bicycle-friendly sidewalks. 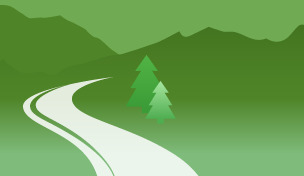 Distinct green trail markers shepherd you eastward through the lively shopping district. As you leave downtown Wheaton, Metra commuter rail tracks share the corridor, allowing you about 2 miles of rail-with-trail experience. 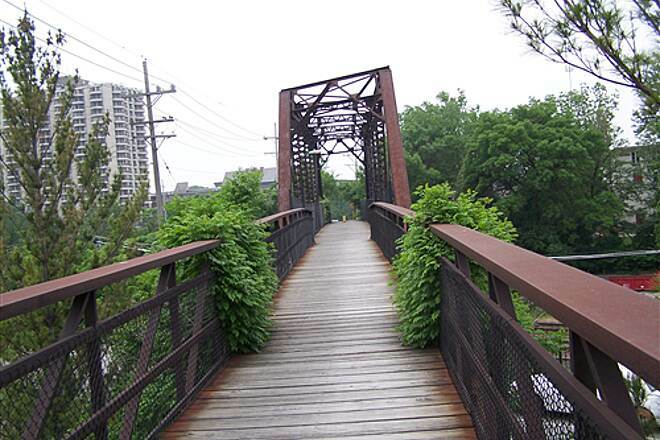 The trail maintains a distinct urban ambience, passing through the heart of the western suburbs. In Villa Park, about 8 miles from the trailhead, a restored train depot houses historical displays and offers water and restrooms. 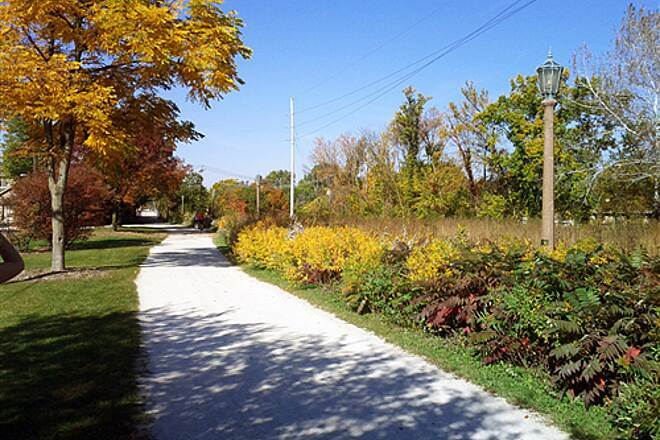 As you approach the museum, a short connector trail on the left links with DuPage County’s Great Western Trail. 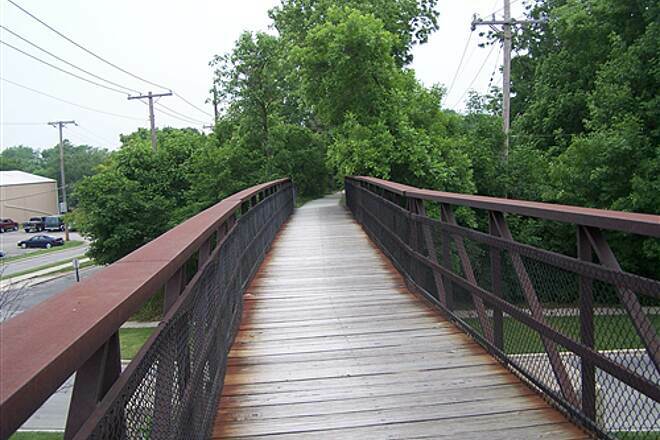 In about 7 miles, the trail crosses First Avenue (IL 171) in Maywood, and a short trek along Maybrook Drive leads to a bicycle-pedestrian bridge over the Des Plaines River. 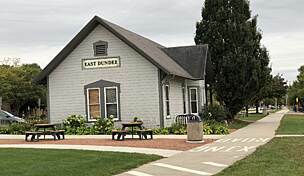 The Main Branch eastern terminus is shortly thereafter in Concordia Cemetery, adjacent to the Forest Park Transit Center. Free parking is spotty at this end, so plan on a return trip along the corridor. 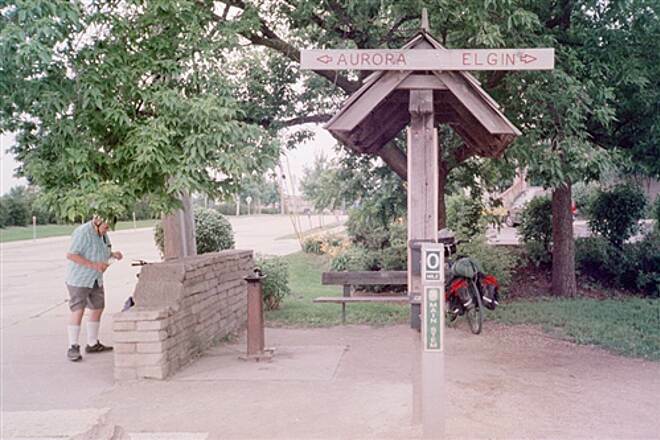 The 13-mile-long Aurora Branch begins at the south end of Illinois Avenue Park at a junction with the Fox River Trail. The IPP travels north on asphalt along the river through commercial areas and older neighborhoods for a mile; then the surface changes to hard-packed crushed stone that makes up the majority of the branch. 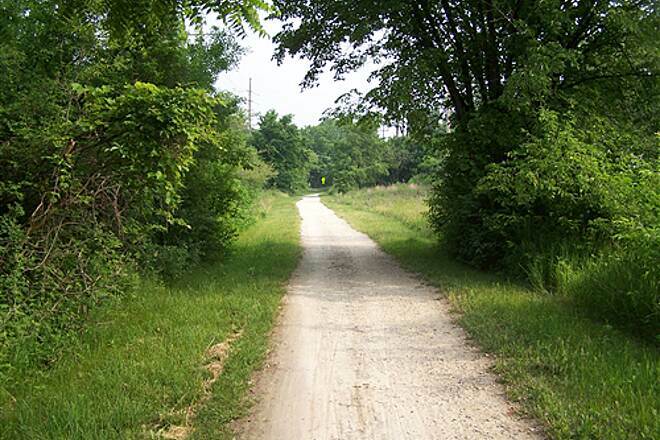 In another 5 miles, look for the trail connection on the left; this is the IPP’s Batavia Spur, which heads 6 miles west to Batavia. Your journey on the Aurora Branch is likely to be quiet, passing through woodlands and fields and beneath high-tension power lines. Wildlife finds refuge on the trail; deer, rabbit, and many bird species are the most common. 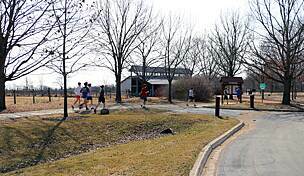 At 3 miles past the Batavia Spur, pay attention where several trails converge at Winfield and Butterfield Roads in Winfield. Just follow the green IPP markers to stay on course to Wheaton’s Volunteer Park. Another 2.2 miles along the Elgin Branch through similar terrain brings you to the connection with the Geneva Spur of the IPP, on the right side of the trail after crossing Geneva Road. 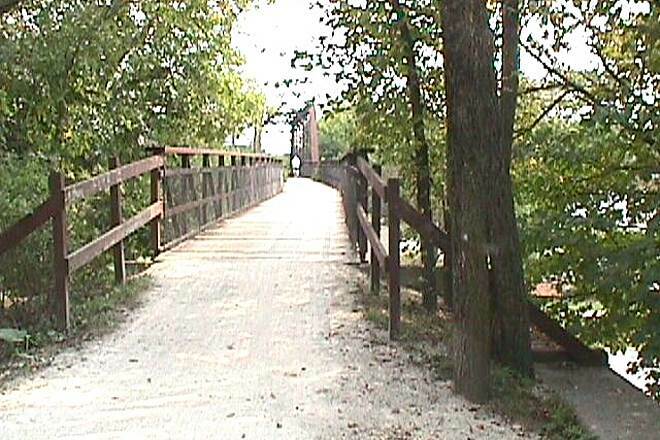 The spur travels 9 miles west to Geneva, where it ends at Fox River Trail in Good Templar Park. Well-manicured neighborhoods indicate your arrival in Wheaton. 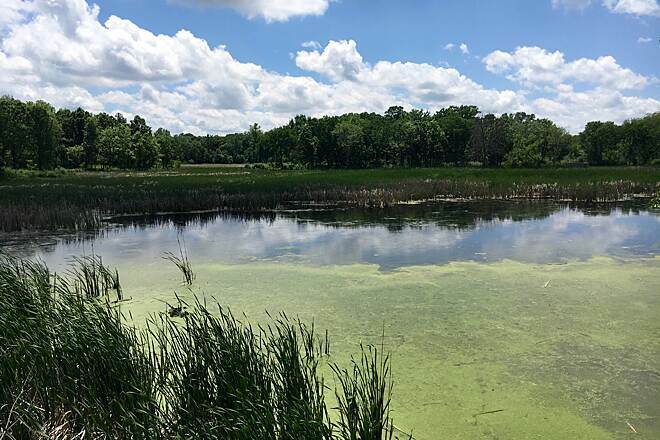 Just when you think you have left the trail’s remoteness behind, the Lincoln Marsh Natural Area affords a bucolic diversion. With multiple overlooks and interpretive signs, the marsh provides the perfect finishing touch. In less than 1 mile, after spanning a bridge over two city streets and three active rail lines, you arrive at Volunteer Park, named after the countless residents who made May Theilgaard Watts’s dream into a reality. Access the Aurora trailhead by taking Interstate 88 to Farnsworth Avenue South; go 1.1 miles. Turn right on Indian Trail and after 1.5 miles turn left on Aurora Avenue for just under 1 mile. 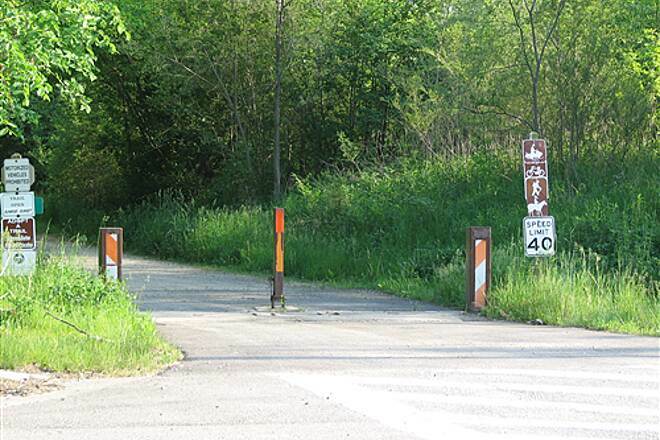 Take a right onto Illinois Avenue and the trailhead is on the right just before the Fox River. To reach the Maywood endpoint from I-290, take 1st Avenue North. The trail is about 0.3 mile north on the left between Quincy and Wilcox Streets; no parking available. 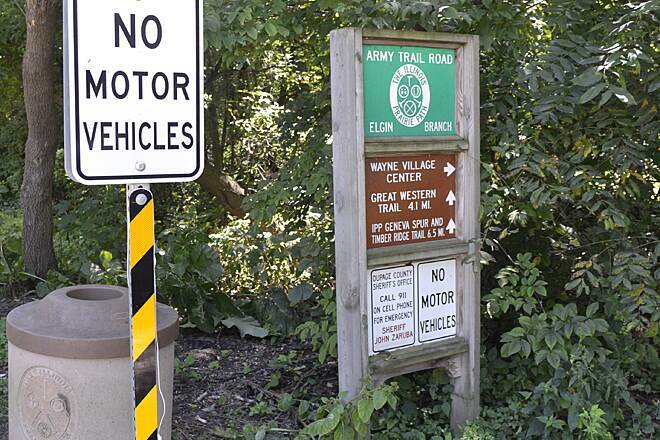 To reach the Wheaton trailhead, take I-355 to Roosevelt Road. Go west 3.6 miles. Turn right on West Street and go 0.4 mile. Make a left onto Liberty Drive. The trailhead is at the intersection with Carlton Avenue. Look for street parking. The Elgin trailhead is on Raymond Street in Elgin. From I-90 take the State Street exit south for 2.7 miles. Turn left onto National Street and go just under 0.5 mile then turn right onto Raymond Street. The trailhead is about 1.3 miles ahead on the right between Purify Drive and Riverview Drive. You can ride this one for hours without getting tired. 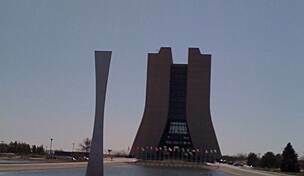 It is well maintained and there are no surprising ramps or things to that effect. One of its biggest defects is the fact that It goes through the center of town in several areas, which means that you need to be aware of the many people that go through it to get to places or just to take a stroll, and yes, I know many would consider that a plus. Rode from Wheaton eastbound to the end in Maywood and back. First time and will certainly not be my last. Gets a bit sketchy the closer you get to the end (well marked in areas that deviate from the path) but had no problems. Conditions in some points were slightly wet and soggy but overall not a problem. Nice mix of crushed stone and asphalt and places to stop and rest on benches. 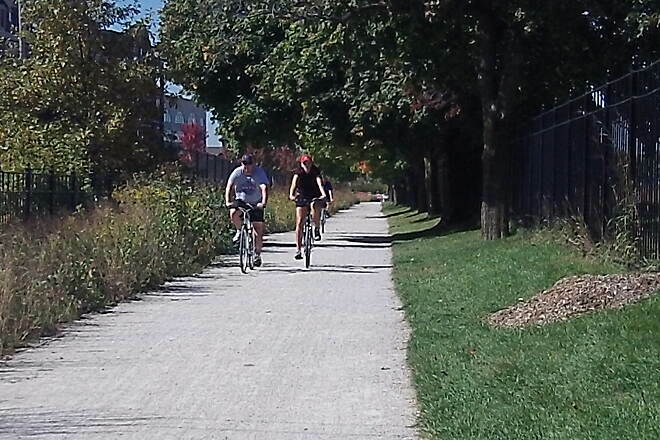 I ride, run, walk, or ski on this trail nearly every day, mostly between Wheaton and Elmhurst. It's well-maintained and very safe. In the dead of winter, the people are gone and the trail is mine! 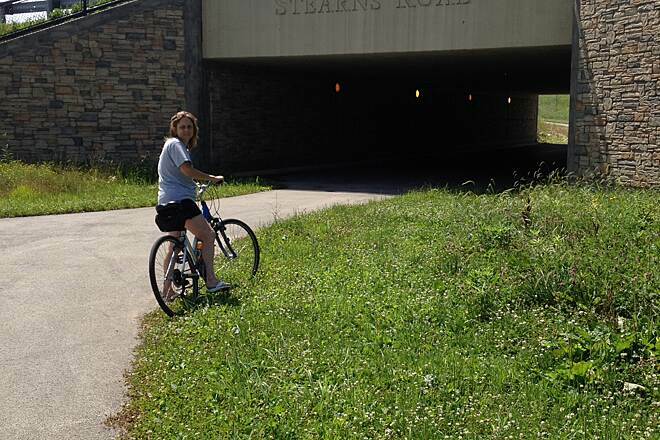 In the summer, you do have to ride defensively on the trail, as others have pointed out. I was hit once by a bike when running--the bike was racing to pass between two pedestrians, as a freight train roared by. Look over your shoulder before you change your position, even on foot! 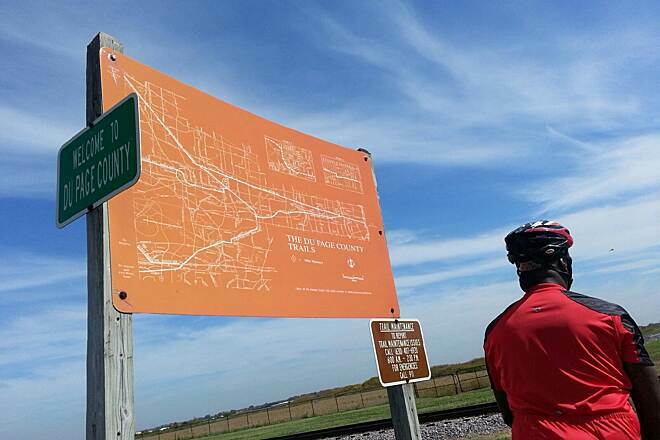 The best part of the trail is due south of Wheaton, beginning at the 0 mile marker. Head south from that marker across Roosevelt Rd. and you will not find any crowds, even in the summer. You will pass a horse farm, Atten Park (which has water), and St. James farm forest preserve--a lovely tour in itself. You can keep going across Butterfield Rd. toward Herrick Lake, which has its own set of trails (and hills). Or, you can ride alongside Butterfield Rd. 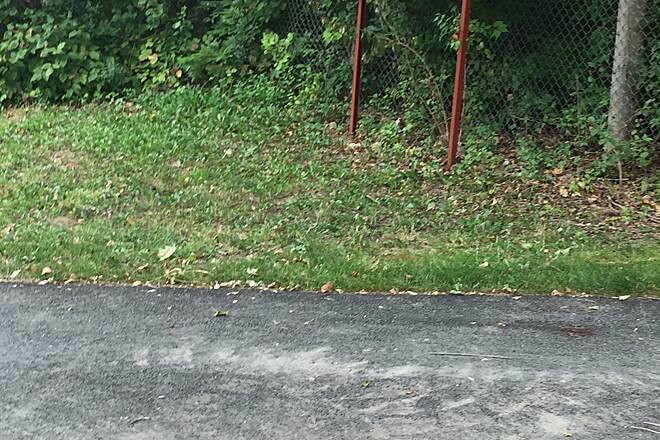 on a nice, paved, rolling path and sidewalk all the way to Two Brothers brewery in Warrenville. 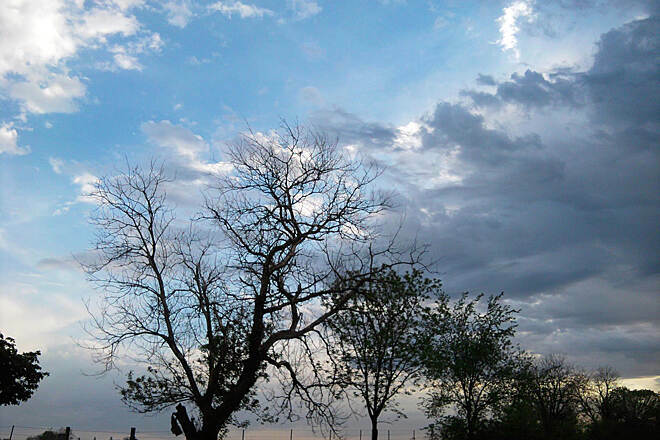 You will have enjoyed a mini-vacation, a great escape in the western suburbs! Excellent trail to walk/run/bike. 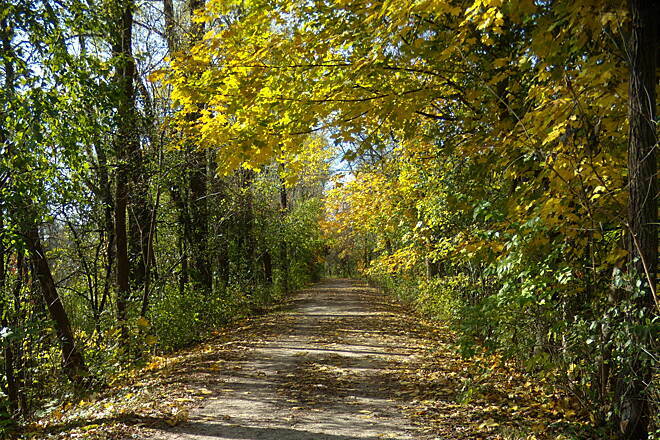 The City does a great job maintaining both this trail and the adjoining Pilgrim trail that meanders through a wooded area on the north of town. Not a trail for visitors. This is mostly a trail for nearby residents. While some may like the long ride alongside a highway being a nice pastoral yet urban dichotomy of the modern age, as mentioned, the frequent light crossings are lame. The best route would be from Flamingo Rd to Markham and beyond (on the levee or through the park paths - mostly Mountain Bike trails or interest but some trails where the disc course leads). Of greatest need are garbage cans at each major road crossing . . . the litter is annoying and disruptive to the nature that IS there. This place is really nice to bike on with family or friends. The width is pretty big, no doubt enough to ride with family or friends side by side. However, it should be noted that the path to become flooded both ways near the Barker-Cypress entrance if it rains for at least half a day or if it rains hard. If you take the path that starts near the soccer fields, there won't be as much water. Exceptional TRAIL for all skill levels! This trail leading from Elyria to Kipton has consistently been "a favorite" for multiple YEARS. 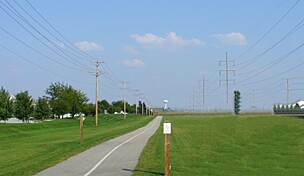 The trail is extremely well maintained and has a smooth asphalt surface for the majority of the approximate 26 mile ride (both directions). No matter what direction you choose to start (Elyria OR Kipton); be sure to stop in Oberlin to enjoy any of the eateries, or perhaps the outdoor market, in the summer. 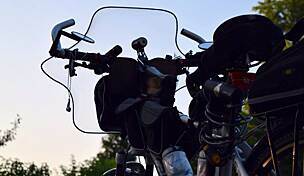 Friendly town & drivers are quite supportive of bikers. 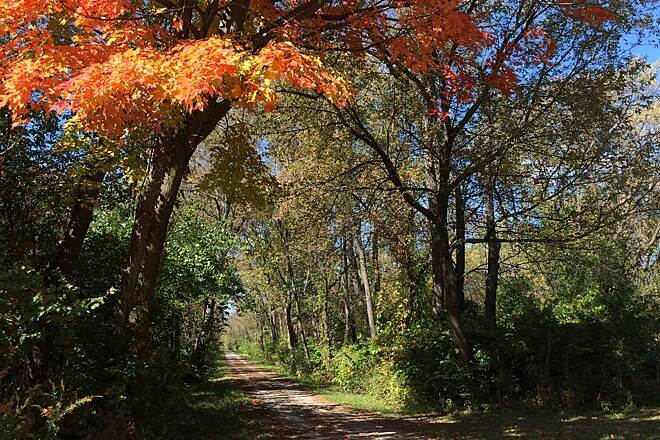 THANKS to the Lorain County Metro Park workers for keeping this trail so pristine! I mostly ride urban streets and suburban roads. 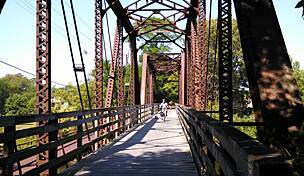 However, I do a lot of rail trails, and when I have a chance to try a new one while traveling I will take advantage of that. I started in the far east at Wolf Summit and went about 20 miles west before turning around. This trail was a miserable experience. The gravel selection used in the tunnels was horrible. In the eastern section that I did I had 5 dogs chase me all on separate occasions. This trail goes along many private properties and this being a rural Red state where people claim to be all about personal responsibility they somehow can't seem to be responsible for their dogs. Many sections of the trail are torn apart by four wheelers, yee-haw. It would of been far better if it wasn't so close to so many private properties each with unleashed dogs. I grew up in rural Pennsylvania. I understand it's different than where I live now in the city, but if you live by a public trail tie up your dog. If you are out of town be cautious going through some of these small towns. The teens in the town will harass you as there is nothing else to really do and the excitement of some stranger with all his teeth passing through will be talk of the town for weeks. Heading south on the Fox River Trail out of Batavia today I decided to take a little detour on the Batavia spur of the IPP with the intent of returning to the Fox River on the Aurora spur. Very soon after departing the Fox River Trail the IPP turned to packed, crushed limestone. Almost all of what I rode from that point was crushed limestone. This is far from my favorite trail surface, but the vast majority of it was in good condition. The first couple miles after leaving the river heading east were a slight incline. Nothing terrible, but after the first mile I couldn't help thinking, "Enough already." The trail did level out eventually. Trying to cross SR56 was a nightmare. Very steady traffic that would finally break in one lane only to be blocked by the other lane. I must have stood there a good four or five minutes before both lanes cleared long enough for me to get across. Funny thing is there was a bridge over Kirk Rd., not a mile from the SR56 crossing, and it isn't remotely as busy as SR56. Other than here and at the end of my IPP journey crossing SR25 in Aurora, which wasn't remotely as bad as SR56, the street crossings were relatively few and not an issue. Several miles further along, some time after the trail started following alongside I-88, the trail was closed. The sign said the closing should have been completed a week ago, but the barricade was still up across the trail. I couldn't see any interruption in the trail from that point but as I wasn't familiar with the area and had no idea what was going on further up the trail I decided to follow the detour. The detour took me about half a mile north to Ferry Rd. and then east on the sidewalk to where the Aurora spur crosses Ferry. The only real issue on the detour was an overpass with a fairly steep incline that never seemed to end. If you're looking for a lot of moderate hill work this would be a good place to ride. I won't be going back that way on purpose. Ferry eventually met up with the Aurora spur and I headed southwest on the spur. A mile or so on the spur and I again ran into a trail closed sign. The detour around this one was fairly short. I think the issue here is the crossing for a railroad line. 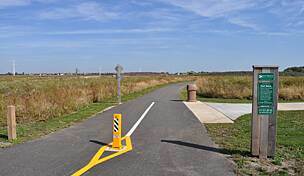 The one problem with the detour was the connector back to the trail appeared to run straight into a fence. In reality it makes a hard right just short of the fence but you can't see that until you're right on top of it. I made a wrong turn into an electrical facility before I saw the trail and turned around. There were a few pretty deep ruts in the run-up to one of the bridges. We did get a lot of rain a few nights ago but I have no idea if the ruts were from that or have been developing for a long time. Enough of the trail was intact that it wasn't a problem but it could become an issue if maintenance isn't done. A couple miles from the end of the Aurora spur I got some payback for the miles of incline at the beginning of the Batavia spur. There was a steady down slope that allowed me to coast, even needing to brake a few times, for a very long way. That was a nice reward toward the end of a long ride. There is a short but very steep segment right near the end of the Aurora spur, just after crossing SR25. It's downhill heading west so I had no problem. Going in the other direction I wouldn't be too embarrassed to get off and walk. If it weren't for the closed sections of trail this would have been an okay ride. Most of the crushed limestone was packed hard enough that it wasn't a traction problem, though I never feel secure riding on that stuff. I'm always afraid of hitting a soft spot and taking a spill. When the closed section of the Batavia spur is re-opened I may go this way again just for the sake of variety. Most of the trail I rode was quiet and in decent condition. I've done almost the entirety of the main branch (I've gone all the way west, not all the way east) and I've done a good portion of the Elgin branch of the Illinois Prairie Path. I like the trail because it's well maintained, fairly easy to ride, the main stem has businesses and water fountains well spaced out to replenish supplies as necessary, but spaced out enough that most of the trail is surrounded by greenery. By contrast to the western parts of the trail, I don't like going east of the 294 tollway on the main stem because, quite frankly, some of the urban areas don't seem the most inviting past there (I personally don't like passing behind apartment buildings with unknown crowds sitting around on rear staircases when I'm alone). Overall, it's a fun trail with enough elevation diversity to keep it interesting. Just watch out for children - there are a lot of family riders on this trail on the weekend, some of whom don't understand that "on your left" means get out of the way! 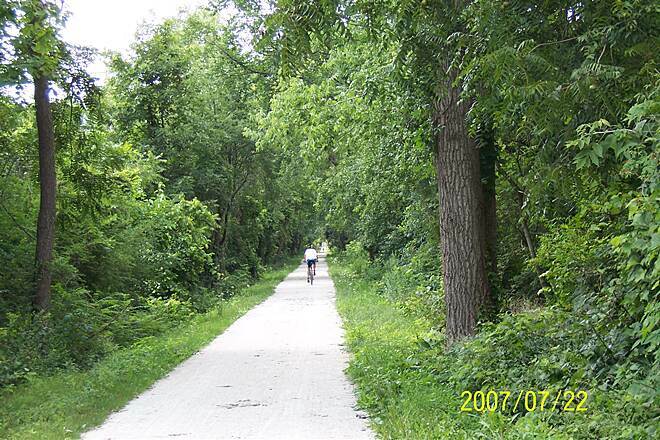 This is one of the longest and most extensive trails in Chicagoland. The trailhead is marked with a small monument on the west side of 1st Ave in Maywood, between Wilcox St. and Quincy St. From here the Main Stem runs west through Maywood and Bellwood. At Mannheim Rd, the trail continues on Warren Ave in Hillside, turns right at Forest Ave, and resumes across Butterfield Road, heading straight through a grassy park near a JW Kingdom Hall. 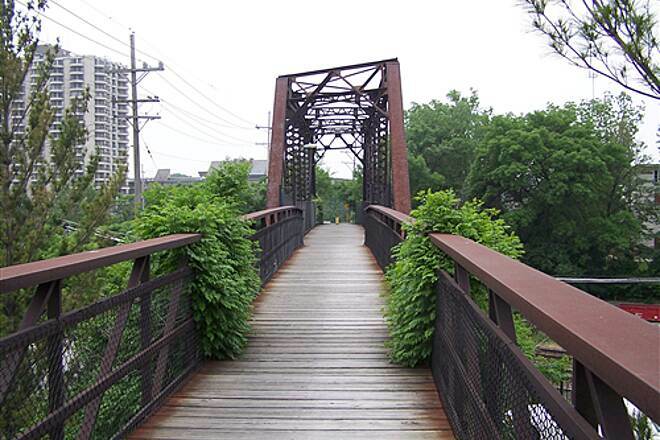 It then runs through Berkeley and Elmhurst, where the trail is screened by trees on either side. It continues through Villa Park and Lombard. 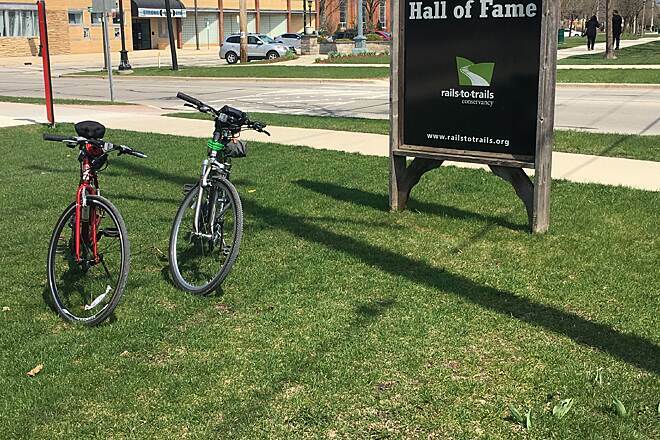 In downtown Lombard the trail stops and one has to follow signs to where the trail resumes. 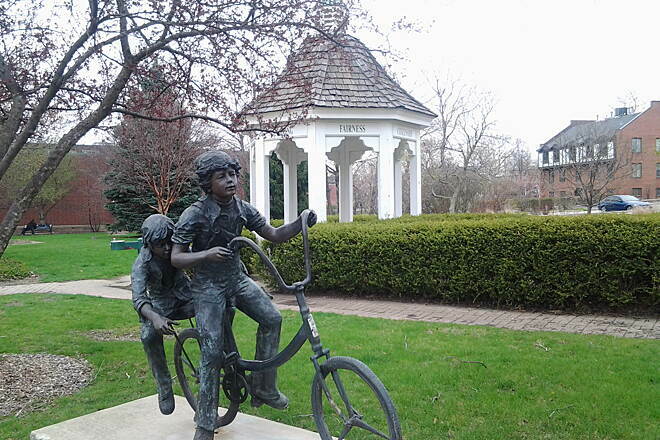 It then continues into downtown Glen Ellyn and finally downtown Wheaton, where another small monument marks the end of the Main Stem. The trail then forks into the Aurora Branch and the Elgin Branch. 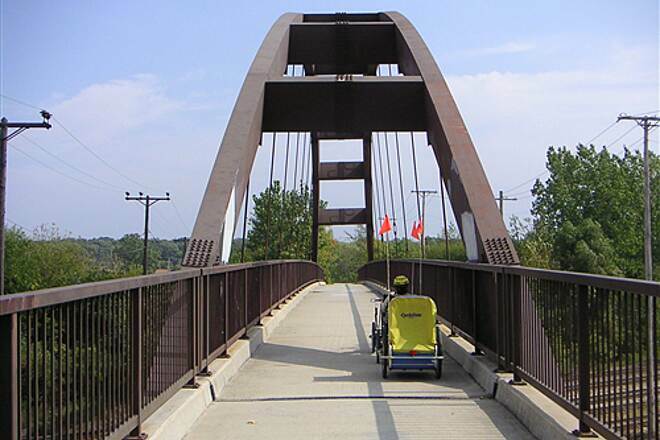 Hopefully this wonderful bike path system may add to longevity! In any case, it makes you feel good physically and is a lot of fun. I am biased, I grew up 2 blocks away and have been on this trail start to finish 25 times in 25 yrs. Best section is Wheaton to Elmhurst. Plenty of water, shops, food along the trail. 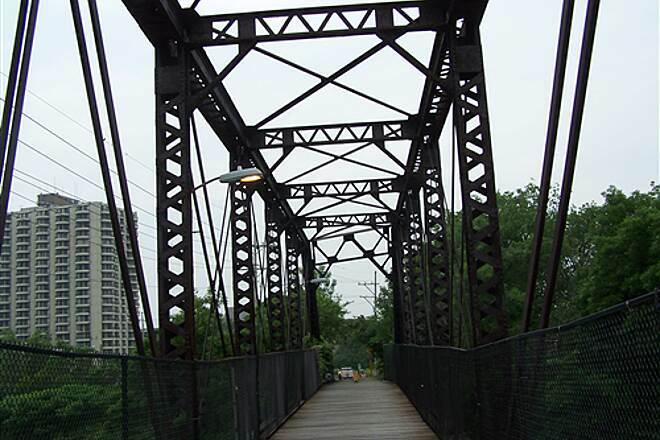 Heard a bridge near the Elgin branch / Fox River is still out. Will be on parts of this trail 10 times this spring and summer. Today was our first trip on this path. I liked that but from Elmhurst to west it has too many street, you must be very careful.However it gave a good opportunity to teach my 7y nephew a lot about the road safety. I liked that a path was in shade so heat wasn't a problem. I liked that everything was accessible, benches, fountains, maps, road marks, everything so perfectly prepared for any kind of user. It was an excellent trip. I want to explore more of this path. 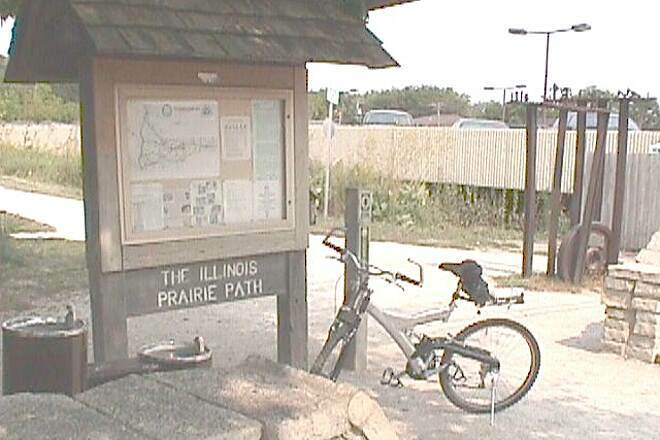 We rode the Illinois Prairie Path in August 2012, starting in Elmhurst and travelling west to mile marker zero. This is a great trail, with the only downside being the many road crossings. But we look forward to returning! In my quest to ride all of the "Hall of Fame"trails, I rode the trail on Saturday and Sunday, Sept 10 & 11. I was surprised on how much I enjoyed the ride even with the numerous street crossings. It was a beautiful weather and there were nice neighbors in which the trails went through. The trail had great signage and the surface was excellent for dirt. I was surprised on the rural feel of some areas on the branches. 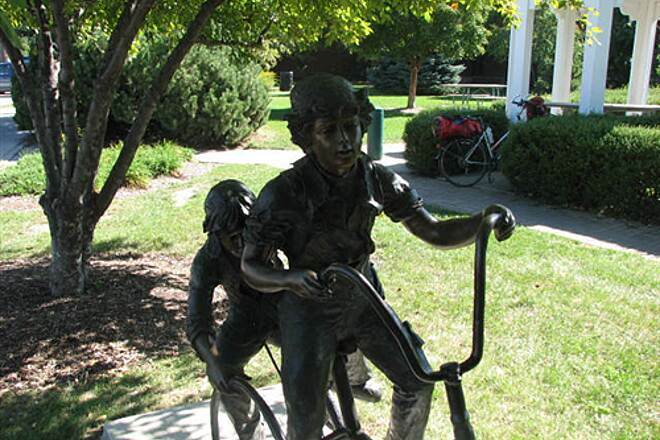 The trail is a real treasure for those communities. The only real negative was the lack of clarity and difficulty in staying on the trail and crossing at Winfield Road. On Saturday, my wife found an excellent Texas style barbeque place in Wheaton just two blocks from the trail near the commuter terminal (we are constantly on the watch for barbeque as we travel around the country). As I was riding the Geneva branch through West Chicago on Sunday morning(9-11), I came upon a fire station where a fireman was practicing Amazing Grace on the bagpipes. There were other firemen in dress uniforms nearby. It appeared they were preparing for a ceremony or parade for the 911 anniversary. 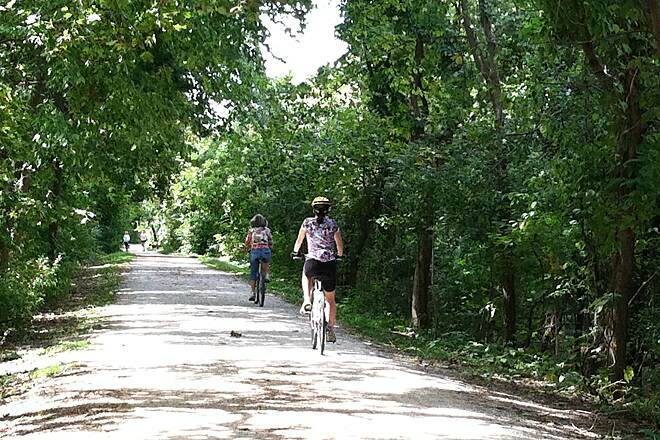 Just recently they have made a new path connecting Fox River Trail to the IL Prairie Path it follows the new stern road bridge/route 25 that they have built. They are also saying their going to build a park buy where the bridge starts on the east side. It's also about a mile and half and all asphalt. Buy the connection with the IPP there are two tunnels so you do not have to cross streets expect for one which is more of a side street but i does have i light. 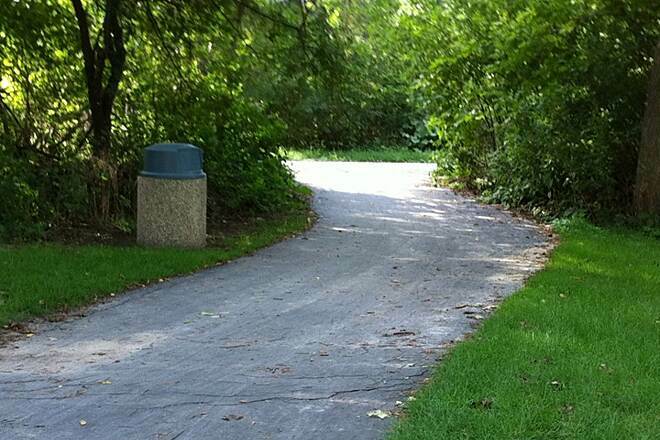 By making this path it makes a bout a 8mile ring around the east side of South Elgin. It connects two great paths and makes a great quick ride. IPP: is the East, the Best? There is also parking on Deihl road between 59 and eola on the south side about 2 or 3 blocks east of the rail road tracks. It is a little hard to see but there is a small sign on the road, its across from a business. The parking offers a map of the trail and other information. 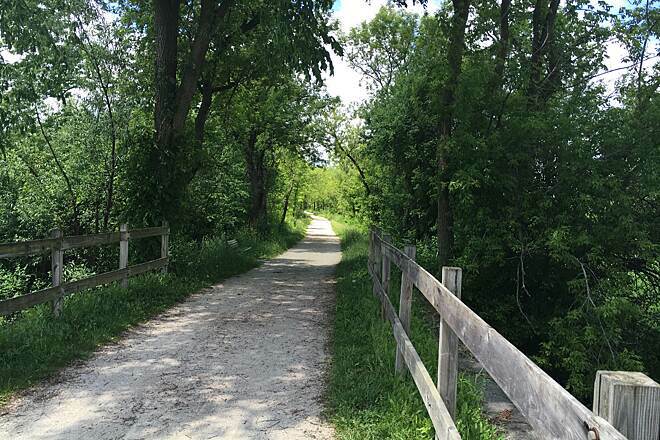 "Close to Elgin, South Elgin the goes through farmland and wooded areas, open fields. The trail is quite flat, and mostly limestone. Not too many people use this part. 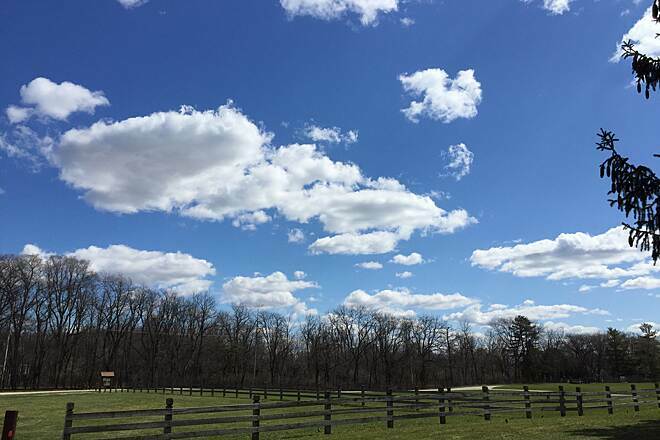 Closer to Wheaton the trail becomes more interesting with horse farms, wetlands, and parks." Some portions of this trail are nice. The section through West Chicago is the worst. 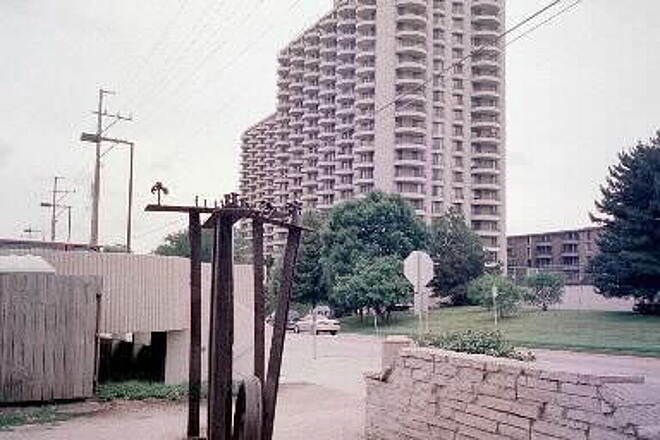 The trail winds behind many buildings. In some instances alleyways and driveways are used. 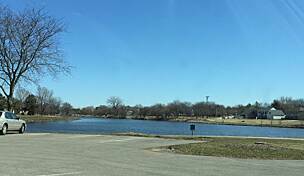 The trailhead on the Fox River is nice. "This trail has some very scenic areas on it. The Elgin branch become rural enough at times that you forget that you are in a Chicago suburb. On the other hand, the trail has too many road crossings in Wheaton and Lombard and points east. In Wheaton, motorists stopped waiting for trains on the parallel Union Pacific tracks will block the trail making it difficult to cross the street. " This part of the Illinois Prairie Path has some good stretches and some bad stretches. The best area was a tree lined section between Prince Crossing Road and Winfield Road near Winfield. The worst area was the east side of West Chicago where the path is nothing more than a driveway and crossroad loaded sidewalk next to Main Street. Absolutly an asset to the community. I only wish I worked near the trail so I could ride to work. I have been exploring the trail and it's access to other trails in the area for three years now and still haven't come close to seeing it all. A definite must see for all involved. "The Prairie Path is the most fulfilling trail around! From Blackhawk Forest Preserve in South Elgin, I usually ride south to St. Charles, where there's a very convenient Starbucks. I continue south to downtown Batavia and then head east to Warrenville and then Wheaten. In Wheaten you will find plenty of places to refuel, including another Starbucks. The Prarie Path Main Stem continues east from Wheaten and takes you through downtown Glen Elyn (the last decent place to stop and hang out), Villa Park, Elmhurst, and eventually Maywood. At Maywood, I double back to Wheaten (or I hop on the Great Western Trail which is two blocks north on Villa St. in Villa Park). From Wheaten, I hop on the Elgin Branch, which I have nicknamed ""The Lonesome Road."" Heading northwest for the most part, the Elgin Branch, which is the last leg of a 60-mile loop, is pretty boring. There's really no place to stop and no one to see. 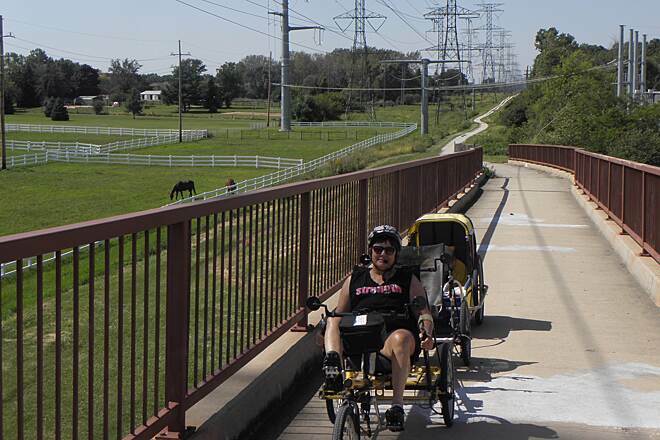 All in all, though, The Prairie Path is a very fun trail to ride while getting some good miles in. " 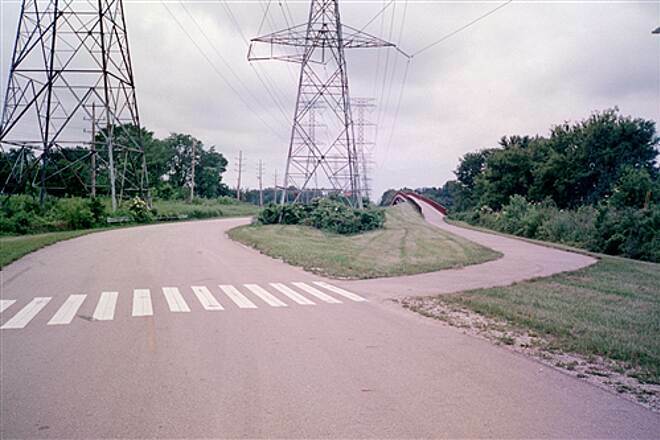 "The crossing of the IPP at Prince Crossing Road has been greatly improved. The original crossing is now closed. Approaching from the east, the IPP now swings north along Prince Crossing Road to meet the Great Western Trail. IPP users cross the road at the Great Western Trail. This crossing has better visibility for both trail users and motorists than the original crossing. 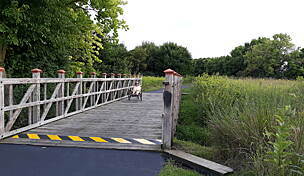 Trail users follow the Great Western Trail to where it currently ends at the IPP crossing. The original section of the IPP west of Prince Crossing Road is now closed between the road and the Great Western Trail. The new route is well marked from both directions." "Mostly quiet, tree-lined path, with public transit (train) access at each end. A former streetcar right-of-way, with some of the concrete support foundations still visible nearer to Elgin. 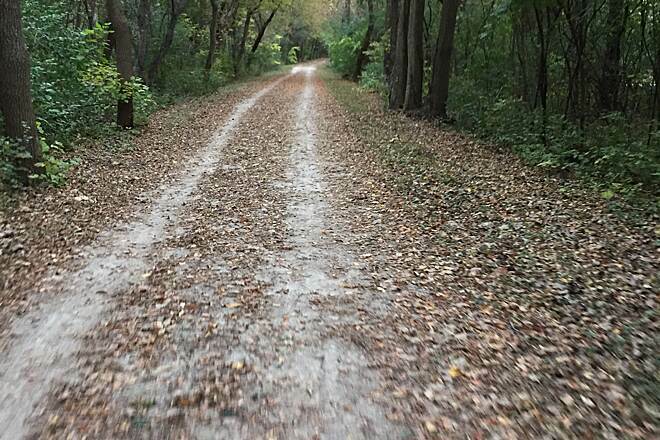 The crushed limestone path can be a bit mushy after a rain, and you can then tell the long-haul bikers by the gray stripe up their back :)"
One of the not-so-nice branches of the IPP the Geneva Branch makes an endless voyage through open fields by the DuPage County Airport. The Geneva Trailhead for the first couple of miles is pretty nice but after that it becomes open fields. 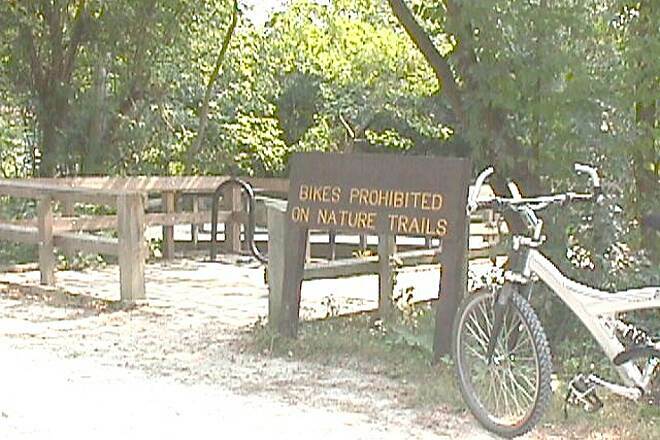 In West Chicago there is no trail. 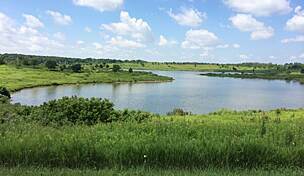 "I have been riding and jogging on the Illinois Prairie Path for 10 years and I always find something new to admire every time I visit. In the meadows and tree stands I have come across deer, fowl, and foxes while riding or jogging. I have seen egrets and heron, ducks and geese in the numerous wetlands. There is also the chance to stop and shop or grab an ice cream cone or sandwich. 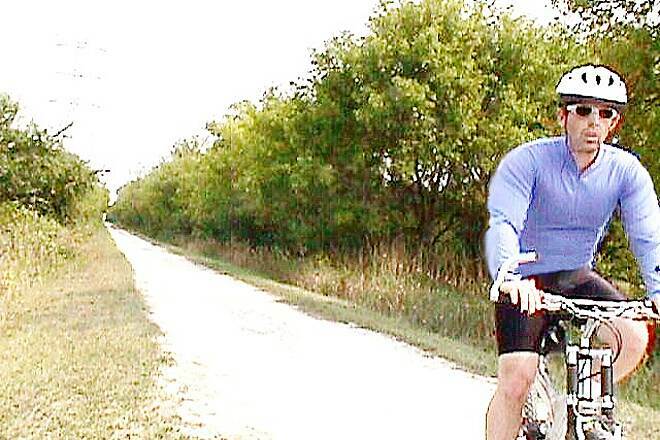 The entire trail itself is over fifty miles long, but my regular bike ride is from Wayne southeastwards to Wheaton, then southwestward to just shy of Aurora, then turning almost due North up to South Elgin, then turning back to the east to Wayne. This roughly-shaped triangle constitutes a 30-35 mile ride that combines quiet and peaceful stretches of wetland and tree stands with suburban and rural sprawl. There are some inclines and the trail surface varies from pavement through asphalt onto crushed stone and dirt. There are fairly frequent zones where one can park and then either start a walk, jog or ride. Most portions of the trail have mile markers. Outdoor washrooms or port-a-potties are somewhat infrequent so plan ahead accordingly. Signs from the Dupage Sheriff's Police advise travlers to call 911 in case of emergencies. I recommend carrying a cell phone on all rides or jogs, not that there is any particular danger on the path - but just in case. 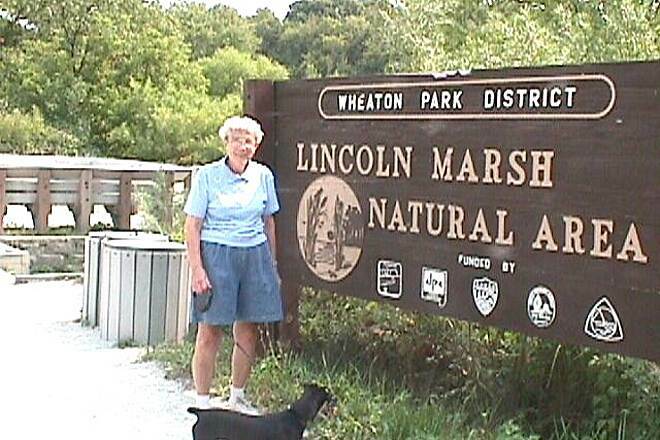 All in all, I recommend the path highly - particularly the scenic areas near the Fox River and the Lincoln Marsh in Wheaton. 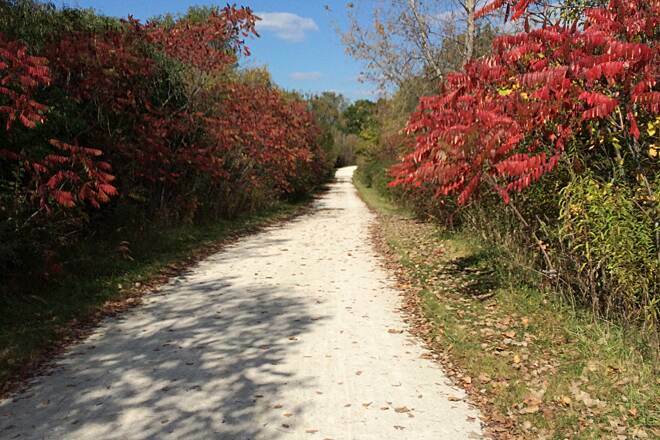 Another good thing about the Prairie Path is that it links to many other good bike paths - the Fox River Trail, Great Western Trail and the biking trails of Fermilab being just a few. "